Well, we’re still getting lots of clouds these days, with predictions for more. So I decided rather than risk a long-cooking and more sensitive meat dish, I’d do something quick and likely to work even with ‘some’ clouds. :) Plus, it’s totally yummy and easy! 12:00 (or about 1-2 hours before you’d like your dessert)—1 can (21 oz.) 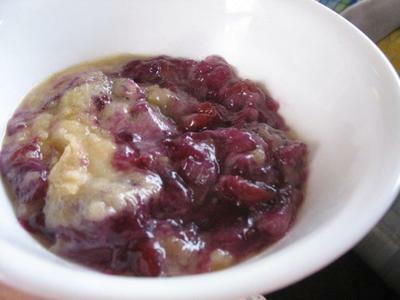 pie filling (we like cherry), 1 can (15 to 20 oz.) crushed pineapple: stir together in Hot Pot. Sprinkle evenly with flour mixture. 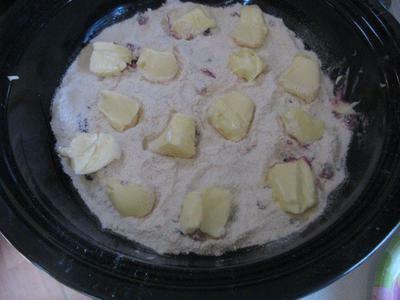 Dot pieces of butter (about 1 stick), distributing all over on top of flour. This recipe is delicious and rather addicting! Yeah, it has lots of sugar (which you could cut back on if you want, and we probably will next time), but it also has good fruit antioxidants and vitamins. Even a little fiber in the whole wheat flour. :) You could also add ground nuts or flax seed to the topping if you like. Oh, this was fun! We enjoyed our Sunday lunch treat and our success even with hazy clouds!